Louis-Ulysse Chopard began his watchmaking company in 1860, and since then it has maintained its status as a leader in luxury timepieces. They have also established themselves as jewelers extraordinaire and there is no more fitting proof than the strong partnership with the Cannes Film Festival. 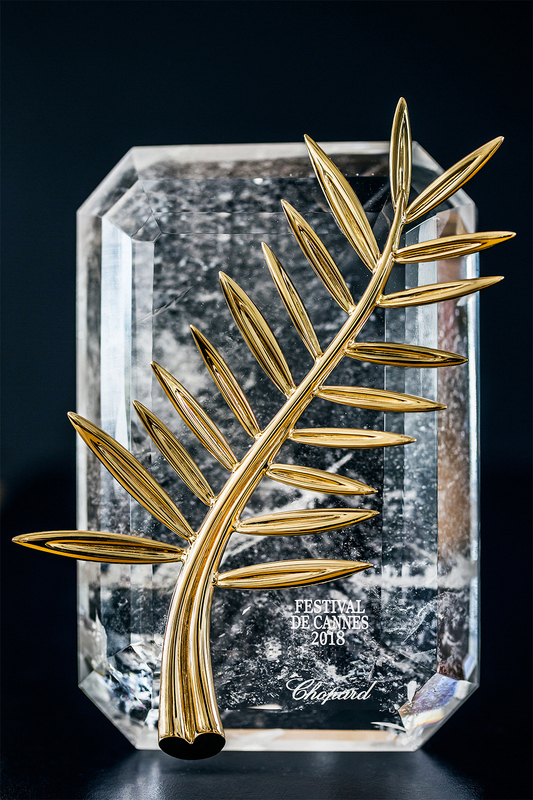 In 1997, the Cannes Film Festival decided their beloved Palme d’Or trophy needed a redesign. 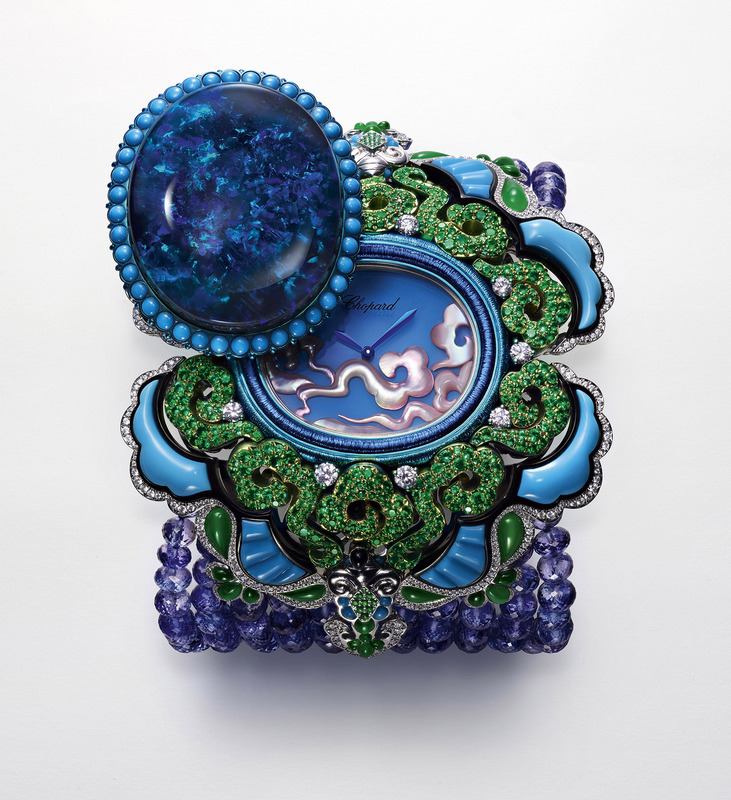 They wisely approached Caroline Scheufele, Co-President and Artistic Director of Chopard. She threw her creative mind into the project and gave them not only a beautiful trophy, but also one that shows foresight. The Palme d’Or crafted by Chopard is made from certified ‘Fairmined’ gold. The Cannes Film Festival is an elegant and extravagant event, and the red carpet is home to the fabulous faces from the film industry, from both on screen and behind the scenes. The ladies and gents are dressed to the nines, and they practically drip with jewels as they traverse the red carpet. The Chopard Red Carpet collection provides a pure expression of the extravagance. 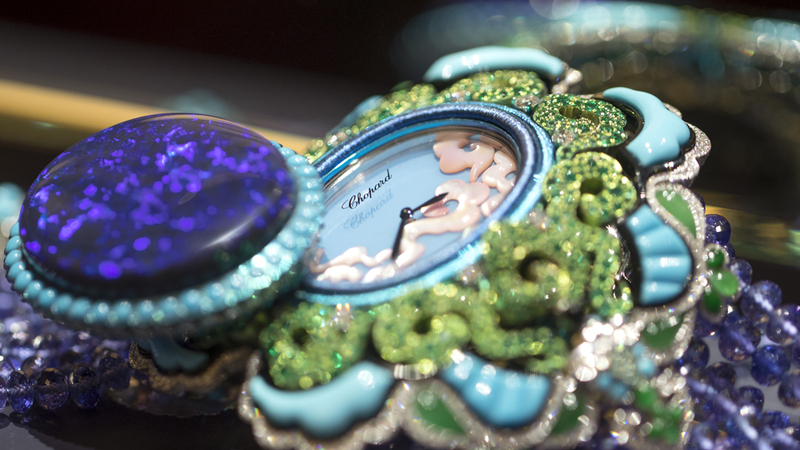 Beginning in 2007, Chopard has created an annual collection specifically for Cannes. This year, the jewellery creations are an anthem to femininity. Caroline Scheufele travels regularly, just as her ancestors did years ago, crisscrossing the globe to seek inspiration for the the masterful creations. Inspiration can come from anywhere at any time, and Caroline sketches impressions when different things catch her eye: an architectural feature, a masterpiece painting, thought-provoking literature, or a cinematic wonder. Chopard teasingly offers us three pieces from this year’s Red Carpet collection to capture our attention and make us want more. 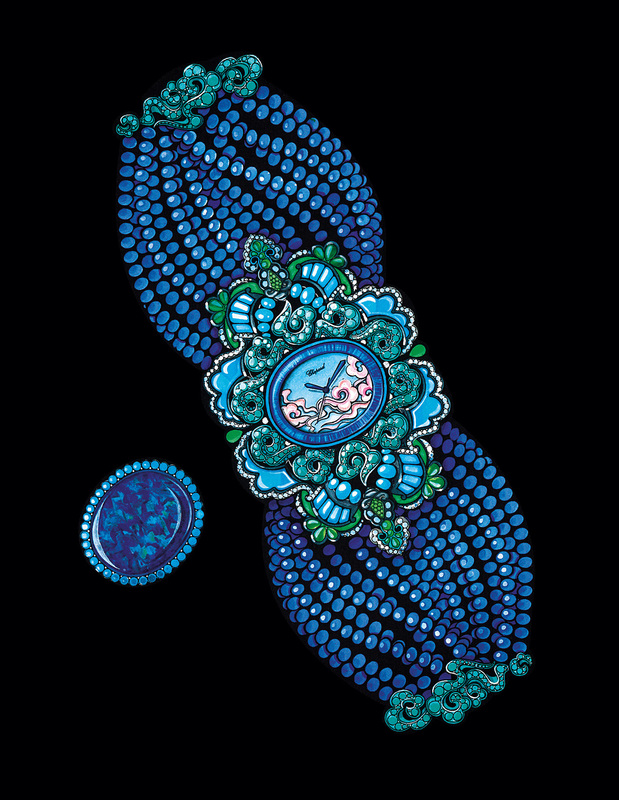 The first piece we are excited to look at is the bracelet of tanzanite and a black opal. It is ornate and elaborate, and perfect for the red carpet. The carved jade adds a touch of the Orient to this ornate work of art. It is the ideal statement bracelet — glorious enough to catch your eye and complement your entire look. And for those non-red carpet days, it is still perfect. Women can wear what they want, and if they need a statement piece to add punch to a regular day, this is the one to choose. 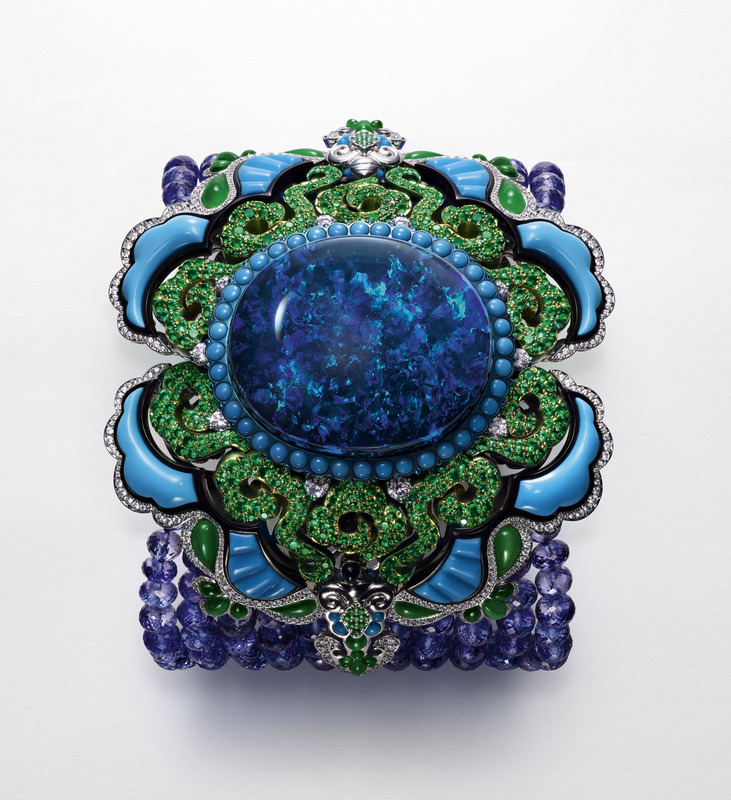 The interplay of the green and blues is remarkable, as if the gems were created in nature in that exact pattern. The black opal at the center of this precious piece is just as interesting. The label ‘black’ can be misleading. While the black opal has an overall dark, or black, tone, it is not entirely black. The carbon and iron oxide trace elements in the opal give it the darkness, which in turn acts as a perfect backdrop (or ‘blackdrop,’ if you will) for the rainbow of colors that any opal possesses. The blues seem bluer, the greens seem greener, all thanks to the blackness. But more than the vivid colors the black opal has, it also holds a special secret. A simple slide of the opal reveals a watch dial. Yes, this piece is beautiful but it also serves a function. The dial itself is nothing to scoff at. While others may have justified a simple watch dial for this elaborate bracelet, Chopard knows that something as beautiful as this bracelet deserves a fittingly detailed watch dial. The dial features an Oriental sky and the spirit of Chinese lacquer work, painstakingly crafted out of dainty pink mother-of-pearl and chalcedony. Tanzanite is a relatively recent discovery. A Masai tribesman came across a cluster of highly transparent crystals in the Merelani Hills, northern Tanzania. The crystals ranged in color from violet to blue. The tribesman didn’t know exactly what they were, but he knew they could be very valuable. And he was right – the crystals were beautiful and unusual, as the color range was vast. Some gems are lighter toned pastel, while others are strikingly vivid in deep colors. The jewellery world took an interest and soon tanzanite was the gem to work with. But what makes tanzanite’s colors so interesting? The appearance of the crystals affected the pleochrism, which means a gem can reveal different colors depending the crystal direction. Fascinating and beguiling. Akin to the many facets of a lady, I’d say. The Asian inspiration first seen in the watch dial is once again evident in this choker, the second piece from the Red Carpet collection. The rows of tanzanite balls, totaling 459 carats, create the support for the red-tinted titanium center. 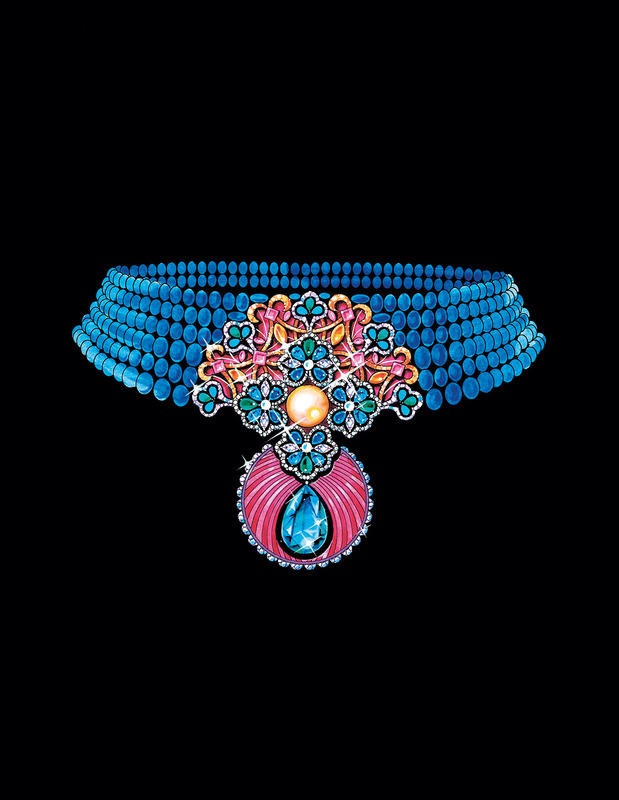 The center is masterfully crafted with a golden pearl, and a wide collection of gems stones – aquamarines, tsavorites, pink sapphires, yellow sapphires, garnets, and diamonds. These gems create a sumptuous pattern and as glorious as it is, the pattern doesn’t take away from the precious pear-shaped aquamarine. At the center of this precious choker is the pear-shaped aquamarine pendant. The name aquamarine comes from the Latin words ‘aqua,’ for water, and ‘marina,’ of the sea. The mineral beryl gives this stone its gentle color, a pale and gentle blue-green. The blue-tinged aquamarine draws you in, like a pool of sea water beckoning to you to take a dip. 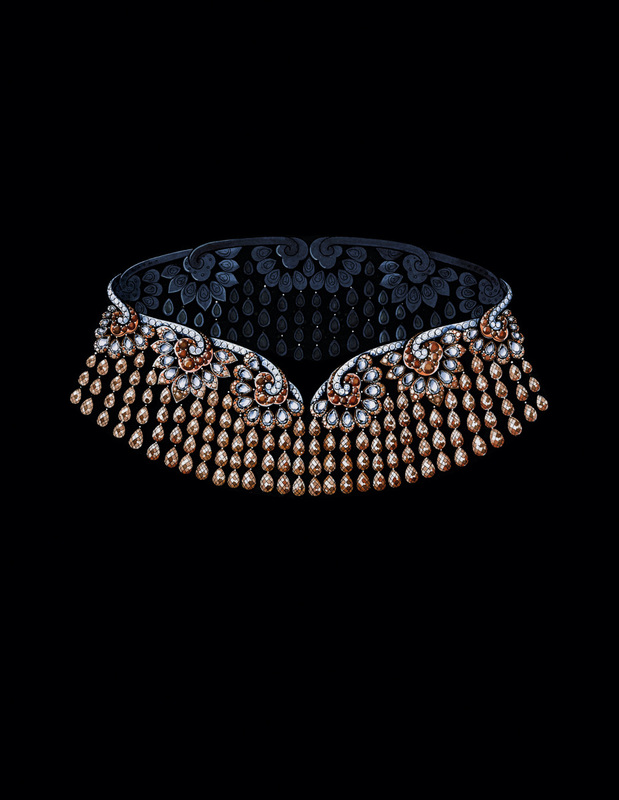 The third piece we gaze upon is such elegance that it is evokes royalty, a modern royalty. Inspired by the F. Scott Fitzgerald novel, The Great Gatsby, this piece calls to mind the decadently extravagant times of the 1920s. The white gold and diamond lacework necklace creates a collar, a one-of-a-kind piece that would look fantastic with your LBD (little black dress), even LWD (little white dress), or your favorite ball gown. The pear-shaped diamonds total 38cts, and are matched with briolette-cut and brilliant-cut colored diamonds. The tumbling cascade design reminds you of the French girandole, beautiful ornamentation in the form of a chandelier. (Chandelier earrings, step aside. The Chopard chandelier necklace has arrived.) 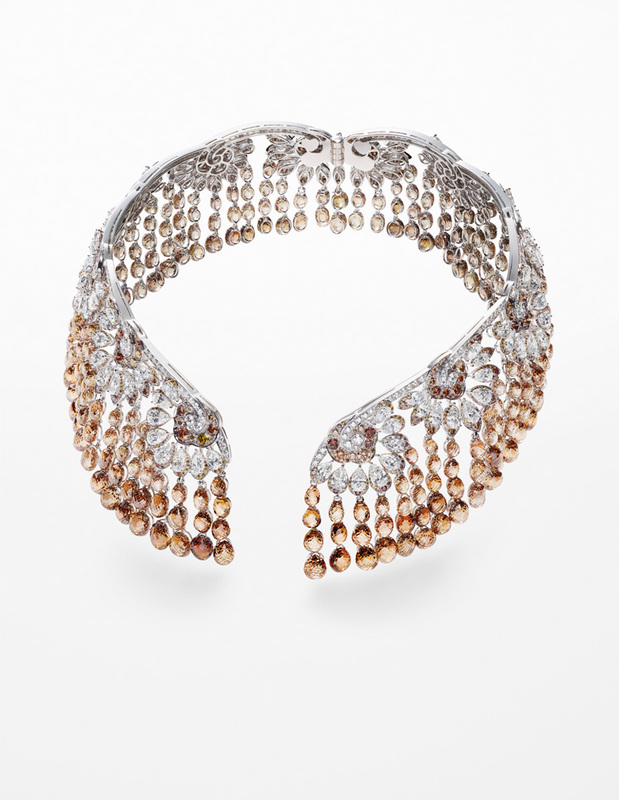 The brown and cognac-colored diamonds cascade ever so elegantly from the white diamond lacework. The piece is romantic yet modern, and thoroughly Chopard. These three pieces are indeed a wonderful indulgence. The exquisiteness of each is a promise that the rest of the Chopard Red Carpet collection will be just as precious and breath-taking. 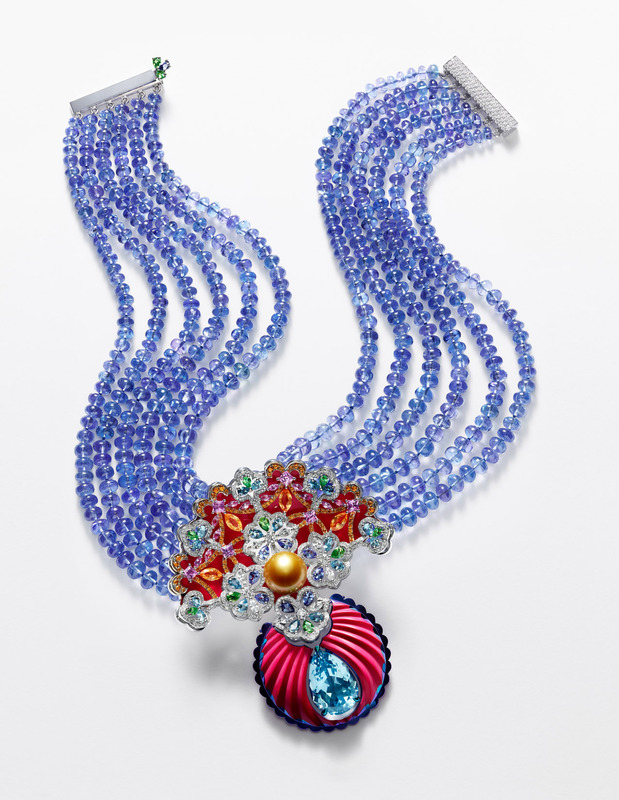 Chopard continues to impress and dazzle us, and we are ever so thankful.